In terms of skincare, I'm focusing on exfoliating and hydrating the skin. I've added a few products into my usual routine, the first being Radical Skincare Express Delivery Enzyme Peel, which contains a combination of fruit enzymes in gel form. The gel is massaged into dry skin in a circular motion for around 3 minutes before it turns into a liquid and then little balls of dead skin form - it's the strangest thing, yet very satisfying! The result is soft, smooth and bright skin! I have two serums on the go: Sond Strength Training and Peter Thomas Roth Water Drench Hyaluronic Cloud Serum. I am using the Sond serum every morning and find that it soothes, hydrates and plumps my skin. It contains pomegranate extract (anti-inflammatory), phytosqualane (rich in Vitamin E to add moisture), moringa and sunflower seed oil (both nourishing and rejuvenating). It absorbs quickly and easily, which means that my moisturiser doesn't ball over it. For days when my skin is feeling extra parched, I used the Peter Thomas Roth serum - a sample size that I received in a gift set and it lives up to its name in that it drenches the skin. It's packed with hyaluronic acid - perfect for dehydrated skin but it's light in texture and absorbs into the skin instantly with the results being felt for hours after. My current go-to moisturiser is Belif The True Cream Moisturising Bomb, which is perfect for my dry skin during these cold winter months. The nourishing effects last all day and the overall result is that my skin is soft, moisturised, supple, smooth and bright. Every night, I use some Estée Lauder Advanced Night Repair Eye Matrix, which has a dreadful applicator (a hard spatula) but is a brilliant product because it makes the entire eye area look plump, rested, hydrated and generally, younger. I often find that if I'm very tired, my eye area looks extra dehydrated and feels tight, but this product combats that. I'm regularly using Glow Recipe Watermelon Glow Sleeping Mask at night because I wake up to renewed, glowing skin. I've previously reviewed it here and here. It's formulated with glycolic and lactic acids, as well as hyaluronic acid and watermelon extract so my skin looks renewed, feels soft and smooth but is also plump due to the hyaluronic acid. The combination of an open fire and the central heating being on for hours on end has my skin dried out so I can't neglect my body. That being said, I know that it's neglected in comparison to my face and neck but I do my best! I always prefer baths to showers and at the moment, I am going between a Jo Malone bath oil and Absolute Aromas Detox Bath Salts. The detox bath salts are very similar to Therapie Himalayan Detox Bath Salts, which help me to relax and sleep well. The salts are infused with aromatherapy oils, which means that they have a really beautiful scent and it fills the bathroom so I can instantly switch off. The Jo Malone oil is a real treat and I love that the oil helps to moisturise my skin and the scent lingers on the skin for a few hours after the bath. In order to keep my skin soft (and prepped for fake tan), I make sure to exfoliate regularly and I am loving Absolute Aromas Detox Salt Scrub. I massage this into damp skin in circular motions before rinsing and the result is soft and smooth skin and the oils mean that my skin is also hydrated. 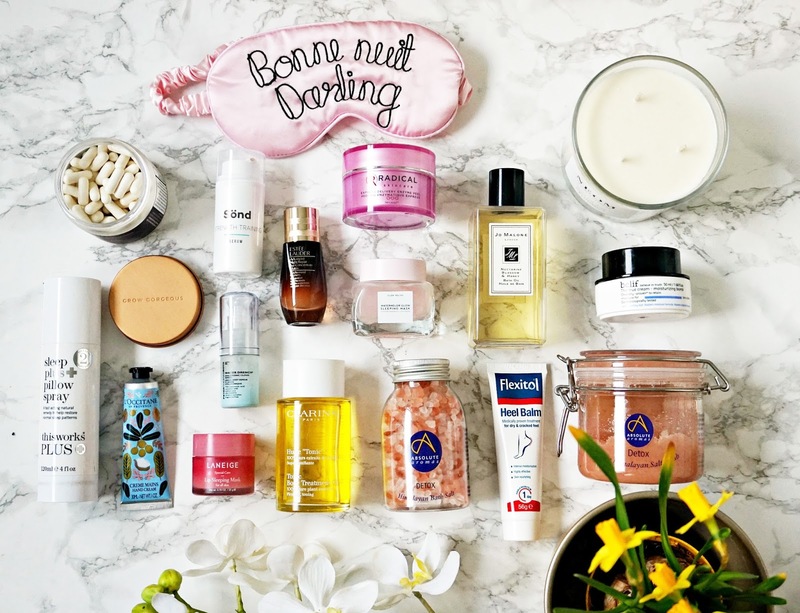 Afterwards, I like to use a bath oil and Clarins Tonic Body Treatment Oil is my current go-to because I find that it helps with the elasticity of my skin and also seems to help with water retention. I slather Flexitol Heel Balm all over my feet at night and put socks on to keep the moisture in (also because my feet are always freezing at night!) - this thick balm softens my skin, keeps them feeling smooth and keeps hard and dry skin at bay. It's effective and affordable. Throughout the day and always last thing at night, I apply hand cream and my current cream of choice is L'Occitane Shea Butter Hand Cream, which is intensely nourishing. I love using shea butter products on my body but I can't use them on my face at all, which is strange. My hair always suffers at this time of year due to the central heating, cold weather and medications so to get it back on track, I am treating from within. Last year I took a course of Grow Gorgeous Hair Density Nutrients and loved the results so I have started taking them again. They contain a blend of amino acids, hyaluronic acids and biotin all of which encourage growth, strength and renewal of hair. Normally at this time of year, my lips really suffer but I have been applying Laneige Lip Sleeping Mask nightly for months and it is a brilliant product - my lips are soft and supple no matter how matte the lip products I wear are. Another nightly staple is a pillow spray. I rotate between a few but my current favourite is This Works Sleep Plus Pillow Spray, which ensures I have a good night's sleep. Usually pillow sprays help you to get to sleep but this particular one is brilliant for helping me to sleep through - I will usually get around 8 hours unbroken sleep but sometimes more. I would highly recommend to anybody who has issues with sleeping. All of these products are helping me to recover and are putting a pep back in my step this January! Are you 'detoxing' or pampering this month? I'd love to hear! All products are bought by me, unless otherwise stated. In this case the Absolute Aromas products, Sond serum, L'Occitane hand cream, Flexitol Foot Cream and Grow Gorgeous Nutrients were kindly sent to me. Opinion is always my own.